I am super excited today because today I turn 20! Birthdays are always fun and exciting, but aside from no longer being a teenager (thank God those years are over!) 20 doesn't come with much exciting. It starts the countdown to 21, 365 days, but who's counting ;). I want to countdown to 21 in a productive way, so that is what inspired today's post. A lot of bloggers have 101 in 1001 lists, inspired by Mackenzie Horan, but the next three years of my life are going to bring lots of changes - finishing college, getting a real job, who knows what else - so I want to do something a little bit more manageable and have a list of 21 things I want to accomplish by the time I turn 21 next summer. 1. Visit at least 2 new places in South Carolina. 2. Visit at least 1 new place outside of South Carolina. 3. Establish productive and effective morning and night routines at school. 4. Go to bed by 11pm every night for a week. 5. Workout consistently for at least a month. 6. Go on 3(+) hikes in the Clemson area. 7. Join and be actively involved in two new organizations. 8. Work on establishing a solid group of friends. 9. Call my parents at least once per week. 10. Find a church at school I really love and attend consistently. 11. Maintain a consistent blogging schedule. 12. Hit at least 15,000 total page views on the blog. 13. Continue to interact with other bloggers and meet one or two in real life. 14. Decide if I want to go to grad school after college and where I'll apply. 15. Take a class outside of my major just because I am interested in the subject matter. 16. Read 5 new books just for fun. 17. Eat 3 real meals everyday for a month. 18. Learn how to cook 5 good (maybe even healthy) dinner recipes. 19. Practicing paying it forward by paying for someone else's coffee anonymously. 20. Send 10 hand written notes to people just because. 21. Try something completely out of my comfort zone. 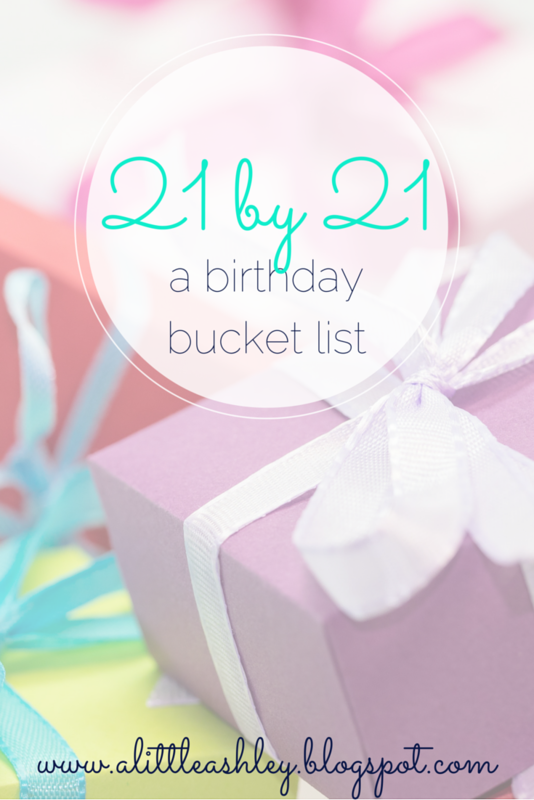 So that is my 21 by 21 list! I will be adding this in a page on my blog and regularly update it with my progress. I am so excited for this new year and new decade (!!!) of my life and really hope to challenge myself with this list. Happy birthday!! I also have a "21 Before 21" (I turn 21 in January! ), and your #4 is on my list, too. I love this format of goal-setting because it's not really long and overwhelming like a 101 in 1001, as you mentioned (even though I do have one of those and would recommend for long-term plans! ).